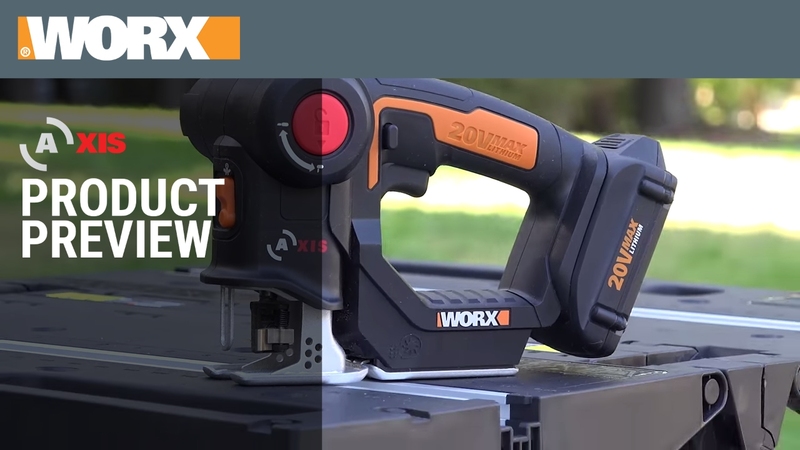 The Worx 20V Axis is a handy cordless tool that combines a reciprocating saw and jig saw to tackle most do-it-yourself projects without the need for two separate tools. At just over 4 lbs., it’s compact, lightweight and easy-to-use multi-purpose saw and ideal for cutting wood, metal, ceramic tile, plastic, tree limbs and more. And since it’s part of the 20V Power Share platform, you can share batteries with other 20V WORX tools you already own, saving time and money. The 20V Axis combines a reciprocating saw and a jigsaw in one useful tool, delivering versatility and power, so you can make the fast, clean cuts your job demands. The versatile Axis accepts virtually any brand of blade so you can easily cut wood, PVC pipe, plastic, fiberglass, aluminum, copper, thin steel and even tree limbs & roots. Great for making quick cuts both indoors and out. The Axis is powered by our efficient Max Lithium 20V battery that’s shareable with other 20V WORX tools, as part of the Power Share platform, saving you time and money. The Axis combines a reciprocating saw and a jigsaw into one ultra-efficient tool, so you can move through projects quickly — saving you time and money. The tool-free blade change system lets you easily switch between a variety of standard blades to cut wood, PVC pipe, plastic, fiberglass, aluminum, copper, thin steel and even tree limbs & roots. This combo tool’s motor is located on the side of its body, allowing the motor and gearing to rotate simultaneously. No slippage or misalignment, just smooth, constant power and a more efficient cut. Our powerful, efficient 20V MAX battery powers the Axis and the entire Power Share family of tools. The 20V Axis features a built-in blower to remove dust and debris, as well as an LED light which both drastically increase your cutting visibility. The 20V Axis combines two powerful tools into one handy tool. Switch instantly from reciprocating saw to jigsaw and back so you power through projects with ease. The tool-free blade change system lets you easily switch between a variety of standard blades to cut wood, PVC pipe, plastic, fiberglass, ceramic tile, aluminum, copper, thin steel and even tree limbs & roots. This multi-purpose saw is great for making quick cuts both indoors and out, including rough-in work, moulding and drywall cuts, craft projects, plumbing & HVAC applications and electrical work. The Axis has a built-in dust blower that clears away dust and debris, freeing up your line of sight while cutting. An LED light also improves visibility by shining brightly on your work area. How heavy is the Axis Cordless Reciprocating & Jig Saw? The power of both a reciprocating saw and the precision of a jig saw are packed into less than 5 lbs, making it perfect for one-handed operation, lightweight and easily maneuverable. I thought reciprocating saws and jig saws were two different kinds of tools. How is this tool both at the same time? Typically, reciprocating saws and jig saws are separate tools, but at Worx, innovation is in our nature. We developed the Axis, which uses a tool-free, quick change button to transition between jig saw mode and reciprocating saw mode. You’ll have the advantages of using the fine cutting control of a jigsaw, with the indoor/outdoor versatility of a reciprocating saw. With a couple of quick changes, you can go from intricate scroll work to trimming branches – with the same tool. Once you try it, you’ll wonder how you ever lived without it. How difficult is it to change between the reciprocating saw mode and jig saw mode? Like all Worx tools, we focus on the experience of using the tools as much as the innovation behind them. Having a two-in-one tool that’s difficult to transform defeats the purpose. We made transitioning between reciprocating saw and jig saw as easy as pushing a button. NOTE: For your safety, we recommend removing the battery before switching the tool between cutting modes. 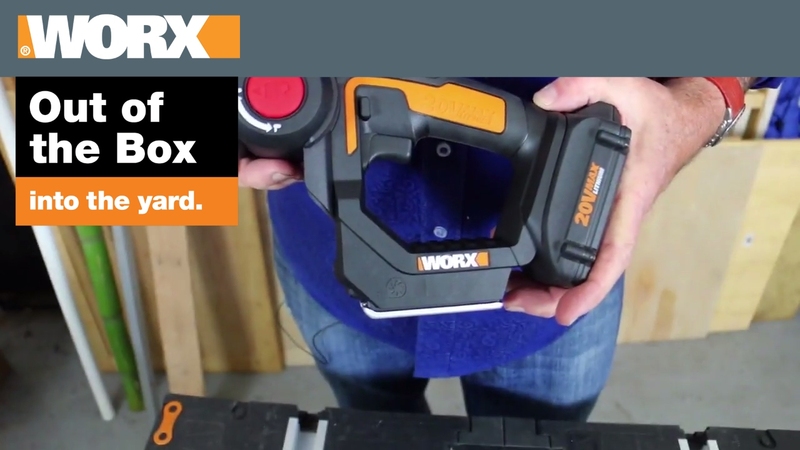 What kinds of materials can I cut with the Worx Axis Cordless Reciprocating & Jig Saw? What kinds of blades are included? The Axis Cordless Reciprocating Saw & Jig Saw can handle a variety of materials including wood, aluminum, and PVC, just choose the right blade for the job at hand. Included in the package. This model includes four blades (3 for wood, aluminum and PVC, and 1 reciprocating wood blade). Additional blades or blades for other applications can be found at most hardware and home improvement stores. How hard is it to change blades on the Axis? While typical saws require an Allen/hex key to switch blades, the Worx Axis features a tool-less blade change you can operate with just one finger. Simply push and hold the switch at the cutting head to open the mechanism. Remove or insert a blade. Release the switch to activate the mechanism to keep your blade secure. What kind of blades does this Worx Axis Cordless Reciprocating & Jig Saw use? Where can I get more? The Worx Axis Cordless Reciprocating & Jig Saw uses standard reciprocating blades and standard jigsaw blades. Customize your Axis by picking the blade most appropriate for the job at hand. These blades can be purchased at most local hardware or home improvement stores. What is the stroke length in reciprocating mode? Does it have a pendulum/orbital mode? Yes, the Axis Cordless Reciprocating Saw & Jig Saw has a pendulum mode and has a stroke length of 3/4”, which will easily handle 2X material. What is the orbital function on the Axis? The orbital function on the Axis is used for those tough reciprocating tasks when aggressive cutting power is more important than precision. Orbital mode provides two dimensional blade movement for more aggressive cutting and improved efficiency. I work on projects that need the traditional features of a jig saw to protect my work piece. Will the Worx Axis provide the same protections? Absolutely! Just because the Axis can become a reciprocating saw doesn’t mean we left out what’s important about a jig saw. Not only is the Axis lightweight enough to easily control with one hand so your other hand can stay on the work, we’ve included a light to illuminate your cutting space for better visibility. The Axis also has a non-marring baseplate and cutting foot to protect the surface of your work, we make it comfortable to use with the safety switch that can be activated easily whether you’re right- or left-handed. Can I attach a vacuum to the Worx Axis Cordless Reciprocating & Jig Saw? This tool does not have a vacuum port. Yes! With Power Share, you can share the battery and save money. Your Axis Cordless Reciprocating & Jig Saw can use any WORX 20V battery you already have. By sharing the battery between tools, you’ll always have the power you need to complete any job. Will a battery-operated saw be powerful enough to get the job done? The 20V Worx MAX Lithium battery included with the Worx Axis Cordless Reciprocating & Jig Saw is the same battery we trust to power the JawSaw, and our Cordless Compact Circular saw, among others, like the Hydroshot and Switchdriver. Since the battery can stand up to those high-powered applications, you can trust it to keep up with you in the Axis. Are there any precautions I should follow when using the Worx Axis Cordless Reciprocating & Jig Saw? ATTENTION: For safety, remove the battery when changing the blades or changing the tool between modes. When changing the blade, we recommend wearing gloves to avoid a pinch hazard. There is a U-shaped piece of metal in front of the cutting area. What is this for? This is one of the safety features included on the Axis Cordless Reciprocating & Jig Saw, like the safety switch that can be activated with either hand. The U-shaped piece of metal is a finger guard that helps protect you against accidental slippage resulting in cuts. If you decide the Worx Axis Cordless Reciprocating & Jig Saw isn’t the right tool for you, we offer a 30-day Money Back Guarantee from date of receipt (less shipping and handling). Please call our customer service center at 1-866-354-9679 (WORX) and we’ll be happy to assist. View more information here. We know your tools are indispensable, so we cover each tool with a 2 Year Limited Consumer Warranty. You can extend your warranty to 3 years by registering online within 30 days of purchase. Already have your Axis? Register now! Many accessories, like blades, are available online under Accessories. 20V Power Share Axis Cordless Reciprocating & Jig Saw - Tool Only is rated 4.8 out of 5 by 18. Rated 5 out of 5 by Joannie from Tree Trimmer I've had this for about a year and it's the best thing I ever bought! If you do any wildlife projects this is the tool to have. From trimming trees to cutting out invasive plants to cutting lumber for that fence replacement. Rated 5 out of 5 by adyouall13 from Two tools for the price of One, is just Great. This Two tools in One works just as good as two separate single tools only I carry One. The cutting power is there and the design is great. The blade goes in either way. Rated 5 out of 5 by tdl8219 from Great saw, very versatile. I bought this tool a couple of weeks ago. Can't seem to put it down.